Ally Scraps: Vintage Christmas village. Hi and Happy December. :) I just received an e-mail from Linda Albrecht with this gorgeous project, and I had to share it right away!! It's only December 1st, so you have plenty of time to get to work on these and have a set for your very own. They remind me of a Christmas wonderland. 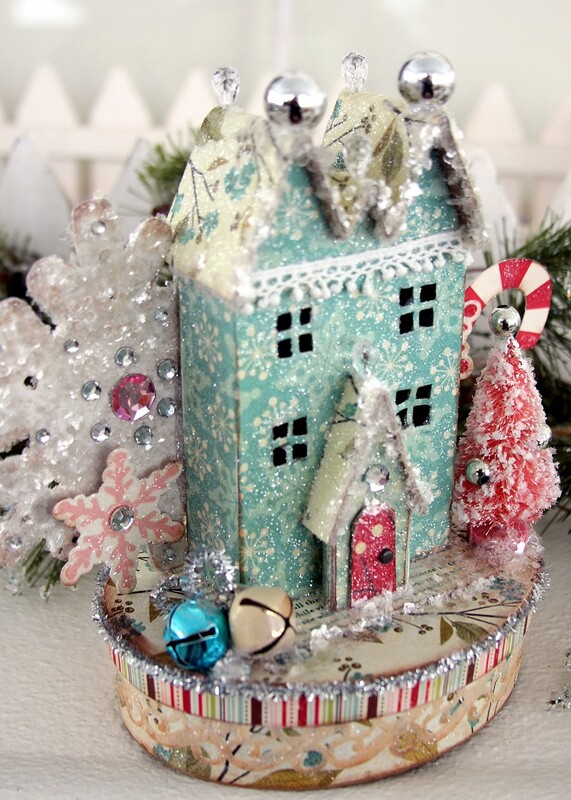 Linda says, "These little vintage style houses are great on top of a box to use for holiday décor and gift giving. They are also a fun size to use for an ornament for your tree. The house patterns can be downloaded at the Victoria Magazine website. They take some time and a little patience, but are worth it in the end. 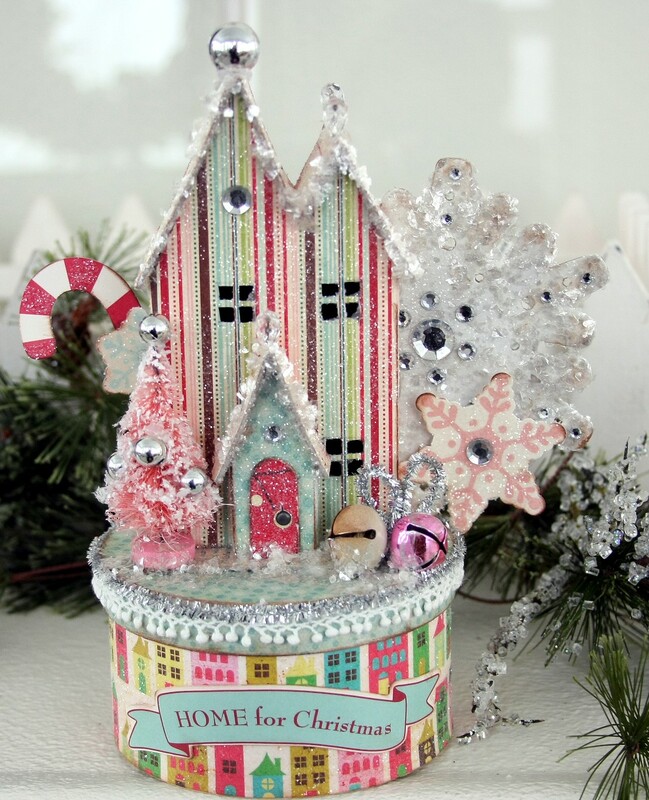 You could also buy pre-made paper mache houses at a craft store." 1. Cut the house pieces from chipboard and patterned papers as desired. 2. Trace and cut out the square window shape onto the chipboard then cut out with an exacto knife. 3. Trace the shape of the window onto the matching patterned paper pieces that will be used for each house. 4. 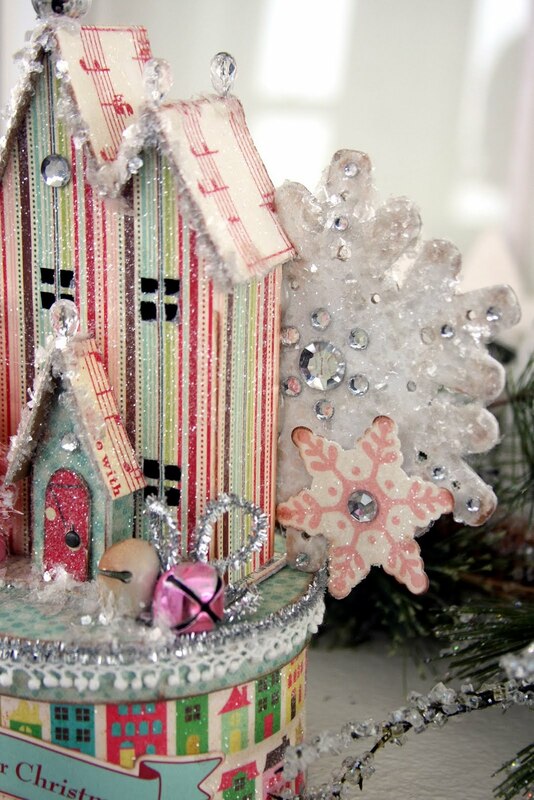 Cut the individual window panes from the patterned paper then adhere the house pieces together with hot glue. 5. Adhere the papers to the house, leaving the roof for the next step. 6. Adhere papers to the roof pieces then place the roofs onto the houses. 7. Fill in any cracks where the roofs and house meet with extra glue and sprinkle on clear glitter to hide any imperfections. 8. The house template pattern does not call for this, but I cut a piece of cardstock and patterned paper as a base for each house to sit on. Adhere the base to the house. 9. Adhere papers to boxes then adhere the houses to the top of the boxes. 10. 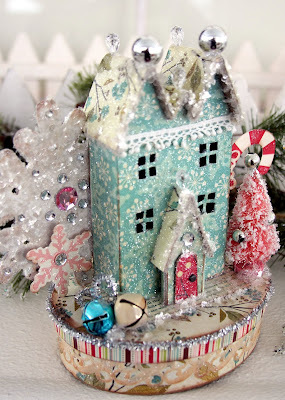 Apply adhesive to the houses and boxes then sprinkle with clear glitter. 11. 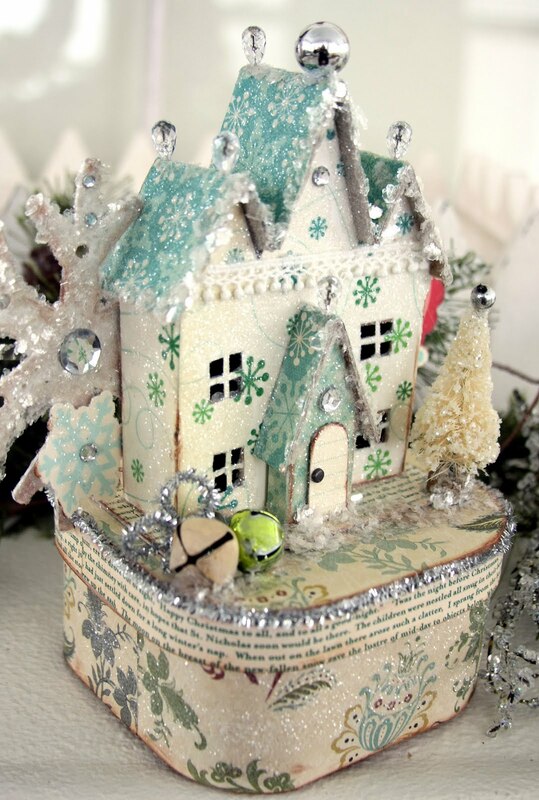 Apply additional adhesive to select areas to add Mica Flakes for a snow effect. 12. 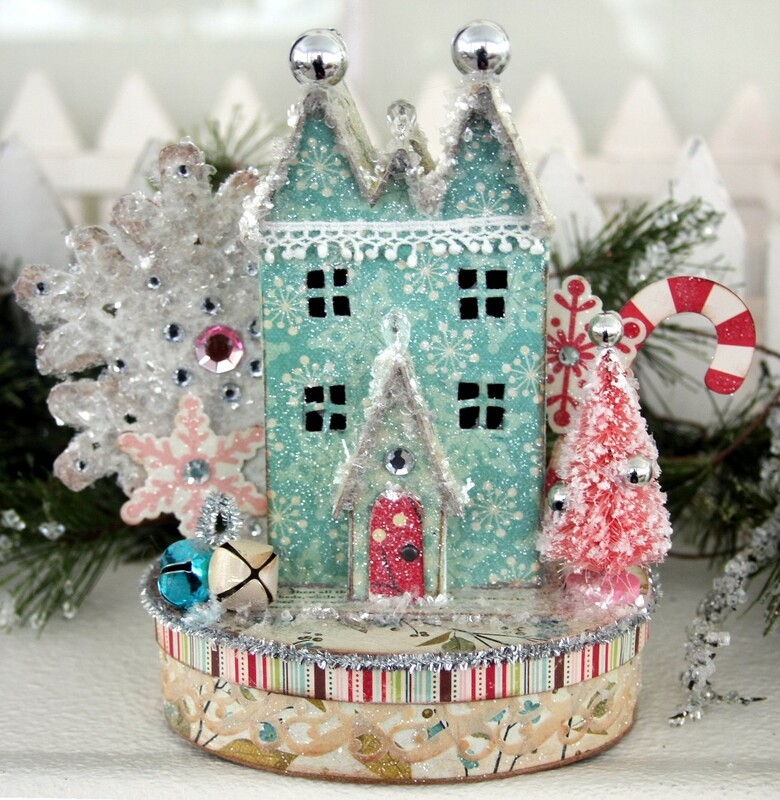 Add decorative pins or silver beads to the house peaks. 13. Apply white paint to the chipboard snowflakes, punch holes to add to snowflake effect then adhere Mica Flakes and rhinestones to them as desired. 14. 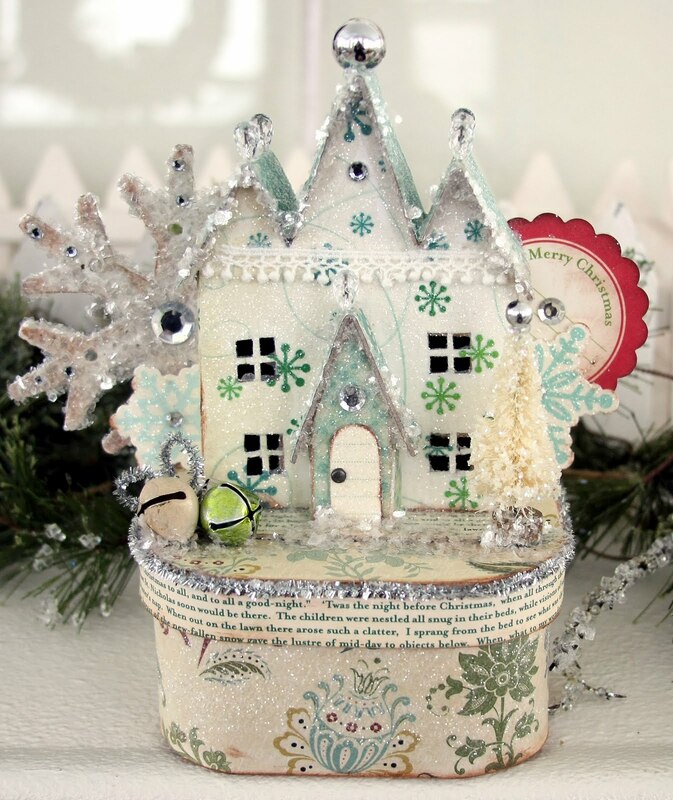 Adhere the snowflakes to the back side of the houses and add any additional embellishments to the box tops as desired. 15. Adhere Sticker Shapes as shown. I pressed the sticky backside of the stickers into clear glitter first, then glued them to the house backs and large chipboard snowflakes. 16. Apply additional glitter and rhinestones to the sticker fronts as desired. 17. Poke a slit in the door to add a mini brad for the door handle. 18. Use hot glue to adhere silver pipe cleaners to the edge of the boxes. Thanks so much Linda, for your gorgeous work, your detailed instructions and your monthly inspiration! Looking forward to your next project, of course. I ♥ these! Thanks for sharing all the details about how to make! waaaah how coool is that?!?! so so gorgeous! These are insanely beautiful! I love, love, love them! And now I want to call in sick to work and stay home and try to make some for my house!! Thank you for the instructions! These are just the most marvelous little houses! these are stunning! simply fabulous. These are just so incredible! These are stunning!! and you have done a fantastic job of decorating them! I love these but cannot find the templates on the Victoria Magazine link. A few others have commented with the same problem. I would love to get the templates. Can't find the patterns either and I would love to make these for my home!! Hope you can help! Thanks in advance!! Beautiful, I wish I was a little plastic elf and could live in one!! They make me smile!! The Christmas Squirrel - a mini book. A big AllyScraps welcome to Kelly Goree! A special way to present your gift. Have you made your Christmas cards yet? ?